Thanks so much for all of your amazing comments yesterday. I am encouraged to take posting detours more often. 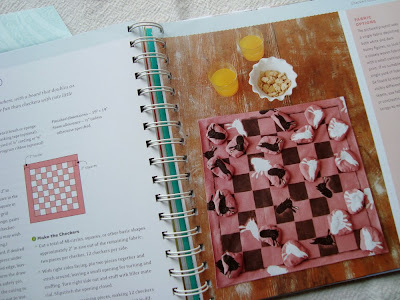 One of the things on my list to share has been a little review of the newly published One Yard Wonders. 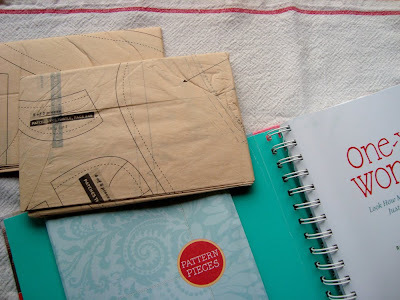 I find sewing books quite irresistible and totally delicious. I might even choose them over chocolate, if I had to... and that's saying a lot. So you can imagine my excitement when Storey Publishing asked me if I wanted a copy, hot off the press, to review! I jumped... and besides, that title hooked me instantly. It was this time last year when I created my own one yard challenge. I had just bought my first bolt of fabric. It was that soft organic cotton you've seen me sew into bunches of things. It took me so long to be brave enough to make that first cut, that I had to come up with a scheme. I decided to cut only one yard and see how many different things I could make from it. That got me over my trepidation, and I started chopping away at that bolt. 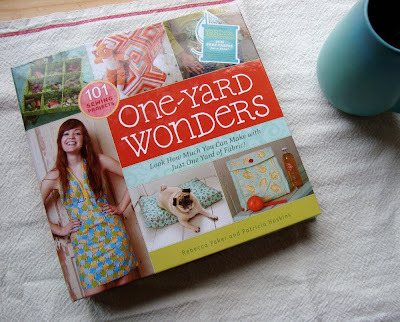 One Yard Wonders is such a great concept: 101 patterns that each take a yard or less of fabric. What a perfect idea for anyone that collects vintage and thrifted fabric... which rarely comes in multiple yards. I love supporting all of the organic fabric lines coming out this year. The price tags are high, but if you only have to buy a yard for a project, it feels more doable. Modern Organic Fabrics is a new good source on Etsy. Authors, Rebecca Yaker and Patricia Hoskins, have done a wonderful job of compiling so many projects, from wearables (for all ages) to home items, into one comprehensive spiral-bound book. I love that all of the patterns are included! That's huge! I also enjoyed that each pattern was created by a different designer (well some created several), for a bit of diversity. So if you're looking for a book, chock full of ideas for everyone on your list, you might want to check this out the next time you're at your local bookstore. In conjunction with the book release, Storey Publishing is holding a Yard-of-the-Month Sweepstakes. 25 lucky individuals will win a yard of fabric for each month of the year. Sounds fun! Happy Friday! I'll be back this weekend with a little of this and that. p.s. Start saving your cereal/ cracker/cookie boxes... and make lots of cocoa so that you can gather some milk cartons, too! This book is on my Christmas list. I am lucky to live within walking distance from Crafty Planet [the store one of the author owns]. She is great - so I'm so glad you are promoting her book! Ooooo! Thanks for the review! I've been eyeing that book. Now, it will go on my wish list. this looks like such a great book - just added it to my wish list too! love this! I hadn't seen it before but the format looks great. I'm working my way through my stash - one project at a time. It can be a challenge to work with only what you have, but rewarding, too. This goes on my list! 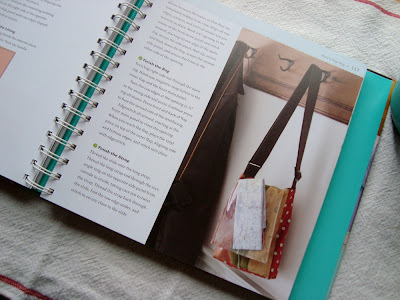 Looks like a great book, I have quite a bit of fabric that is under a yard, like you said, perfect for thrifted fabric. I really like the idea that there are projects from different designers in the one book. I'm just starting to get back into sewing after a many-year hiatus, so one yard projects are very appealing. Thanks for the review! I saw this book the other day, it looks awesome! Gracias Maya por pasar por mi blog! Hola desde Spain, tienes un blog divino, eres toda una artista. Te he tomado prestada una foto del libro para mi blog, espero que no te moleste, pero lo acabo de recibir y no tenia ninguna.